In its debut collection, Vetements produced a hoodie that riffed on the classic Champion style complete with twisted logo that cost close to $1,000. It was all over street style blogs and stars like Selena Gomez. What was your reaction when you first saw it? Champion Europe [which is in the process of being acquired by Hanes Brand International] and I collaborate very closely in terms of product strategies, collaborations and aesthetics and it was funny because I saw it at the same time as their team and we were both like, “Hey wait a minute. Who is this? What’s going on?” I knew of the Vetements brand, but it was the first time that we had seen the Champion logo twisted like that. What was it like working with the Vetements team? They’re a great group of people—very talented and very respectful to both of our brands. Getting the product to where it needs to be has been a lot of fun. It was definitely a new challenge and it was a very creative challenge (we manufacture performance styles, after all). But their team was very respectful in twisting these iconic styles in a way that’s right for their brand as well as ours. Well, for instance, Hanes is all about the iconic tee. So it was about taking the classic crewneck silhouette and figuring out how you put it into their design aesthetic, interpreting the Hanes classic in a way that felt true to the Vetements brand in neckline, shape silhouette, and overall aesthetic. We had to use different resources to get it done, and a different factory for some of the styles, but it’s still Hanes fabric. It still has integrity. Do you think the collaboration will have an impact on sales of regular Champion gear? I think it’s too soon to answer that question. 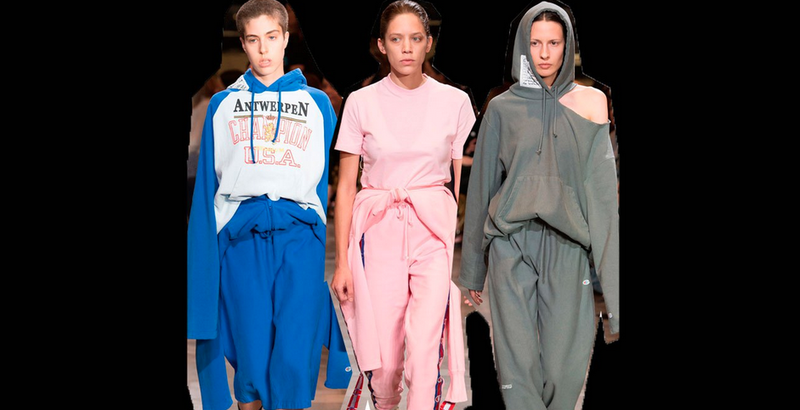 Vetements is so hot right now so there is certainly a strong buzz. But we’ve got our own pretty strong collaboration strategy; the Champion brand and our lifestyle strategy are on fire right now. That’s why it’s great partnering with Vetements. We help each other tell a good story together. And it’s fun playing in a different parts of the market. What’s the benefit, then, of partnering with Vetements? Vetements has a more modern aesthetic. It’s connected to designer and to streetwear, it’s tapping into this amazing influencer in street culture right now, and that’s super important. In the past, you’ve also collaborated with Urban Outfitters and Supreme. Why is important for Champion — a brand that is known for making nondescript basics — to collaborate with other labels? It’s part of a halo strategy. With our Vetements collaboration, we’ll sell at Barneys. We also sell at Urban Outfitters and at Dr. Jays. Both of our brands are approachable for all channels and all retailers. It’s not unrealistic that someone would not believe that Champion is sold at those retailers. But what makes the balance is that we’re also in your big box stores and department. We’re very strategic in who we partner with to what extent and in what channels. Champion is all about authentic and heritage—and we’re very careful not to get too far from that. So overall, athleisure has been positive? Well, we have a lot more competition than ever before. There are so many active brands now. Every time you turn around there’s a new activewear collaboration or athleisure collection. But when you think about, who does the best authentic hoodie? It’s Champion, right? We’ve got amazing product and we were the true innovators in the active apparel market. We were the first ones to patent the reverse weave [a revolutionary and technical procedure that minimizes a garment’s shrinking and warp]. We’re authentic, we’ve got an amazing heritage, and we’re authentically invested in sports. We were the original so we’re still relevant. I love seeing someone on the street wearing Champion, and it could be a hip young girl in an oversized worn-in Champion sweatshirt that’s cropped to whatever length she loves. And it probably used to be someone else’s favorite sweatshirt. Today we have a lot more competition, but it keeps us on our toes. You all know I love a good collaboration, and with Hanesbrand Inc. at that! Right in my backyard with the headquarters located in North Carolina! Leave your comments with your take on the collab. and any other collections you saw during NYFWM that must be mentioned! Entire collection can be seen on Vogue.com!